The Trump administration has spent much of its tenure trying to sabotage the American health-care system. 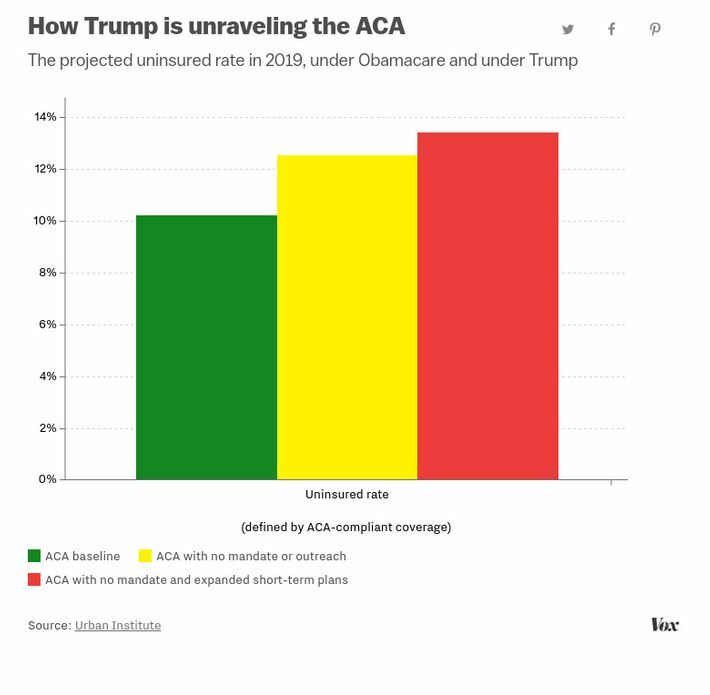 In interviews with major publications last spring, Donald Trump repeatedly threatened to deliberately destabilize the Affordable Care Act marketplaces by abruptly halting subsidies to insurers. Last September, he made good on that threat. Meanwhile, his Health Department spread doubt about whether it would enforce the tax penalty for refusing to sign up for insurance; cut funding for the law’s outreach groups; slashed Obamacare’s advertising budget by 90 percent; spent a portion of the remaining ad budget on propaganda calling for the law’s repeal; cut the open-enrollment period by 45 days; announced that it would be taking healthcare.gov (where people can enroll in Obamacare online) offline nearly every Sunday during that time period, for “maintenance” purposes; described Obamacare as “a bad deal” that Americans “won’t be convinced to sign up for” in official public statements; and, most recently, expanded access to “short-term” health plans that do not meet Obamacare’s benefits requirements (and thus, are useless to anyone with a preexisting conditions, or who develops a serious condition after purchasing the insurance). Experts expected all of these measures to depress participation in Obamacare, especially among the young and the healthy, thereby forcing insurers on the ACA marketplaces to jack up their premiums. The Trump administration insisted that they were wrong. “We expect virtually no impact on the individual market premiums,” Seema Verma, administrator for the Centers for Medicare and Medicaid Services, said of the expansion of short-term insurance, in an interview with Vox. In a shocking turn of events, a new independent analysis from the Urban Institute suggests the experts have the better of this argument. Come 2019, the number of people without health insurance will rise by nearly 5 million, while millions more will enroll in “short-term” plans, according to Urban Institute research released Monday…Those short-term plans will be popular because they are dirt cheap, relative to the usual price of health insurance. But that’s only because they aren’t available to people with pre-existing conditions and leave out key benefits like mental health, maternity care and prescriptions ― which at least some of those beneficiaries will need when they get sick. Meanwhile, some people who need or want more comprehensive coverage will have to pay more for it, as the study predicts premiums for such plans will rise 18 percent. And the federal government, which subsidizes plans for lower-income consumers through tax credits, will have to spend more money. 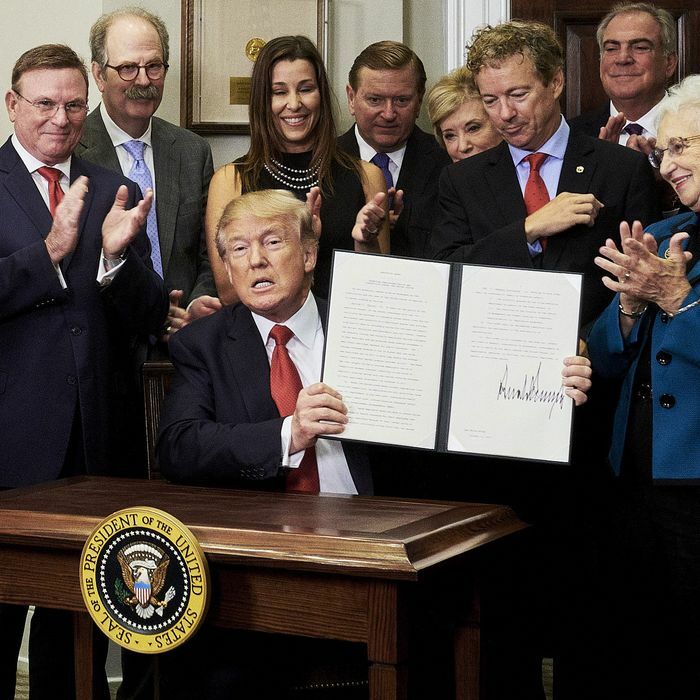 In sum: Trump has effectively replaced Obamacare with a federal health-care program that’s nearly identical — except that it covers fewer people, charges higher premiums, and costs the government more money. But it also makes the “libs” feel a little bit more “owned.” And at the end of the day, that’s what really matters.